Background Previous studies of childhood psychosocial adversity and age at menarche mostly evaluated single or a few measures of adversity, and therefore could not quantify total psychosocial adversity. Limited knowledge is currently available regarding childhood psychosocial adversity in relation to age at menopause and reproductive lifespan. Methods We examined the associations of total and specific components of childhood psychosocial adversity with age at menarche (n=8984), age at menopause (n=945), and length of reproductive lifespan (n=841), in mothers participating in the Avon Longitudinal Study of Parents and Children. We used confirmatory factor analysis to characterise lack of care, maladaptive family functioning, non-sexual abuse, overprotective parenting, parental mental illness and sexual abuse. These specific components of childhood psychosocial adversity were combined into a total psychosocial adversity score using a second-order factor analysis. We used structural equation models to simultaneously conduct the factor analysis and estimate the association with the continuous outcomes of interest. Results Total childhood psychosocial adversity was not associated with age at menarche, age at menopause or length of reproductive lifespan. When we examined the separate psychosocial adversity constructs, sexual abuse was inversely associated with age at menarche, with a mean difference of −0.17 (95% CI −0.23 to −0.12) years per SD higher factor score, and with age at menopause, with a mean difference of −0.17 (95% CI −0.52 to 0.18) per SD higher factor score. Conclusion Childhood sexual abuse was associated with lower age at menarche and menopause, but the latter needs to be confirmed in larger samples. Psychosocial adversity in childhood/adolescence can have a broad influence on development, including reproductive timing.1 Different aspects of childhood psychosocial adversity have been explored in relation to age at menarche, including paternal absence,2–9 parental divorce,5 10 11 parenting/family characteristics,2 4 7 10 12 13 parental marital satisfaction,11 parental mental illness,4 5 12 placement in foster care/adoption,2 14 death of a parent,5 13 and physical or sexual abuse.2 5 14–20 This literature suggests that greater childhood psychosocial adversity is associated with earlier sexual maturity. The objective of the current study was therefore to examine associations of total childhood psychosocial adversity with age at menarche, age at menopause and length of the reproductive lifespan in mothers from a large contemporary population-based British pregnancy cohort. Using a wide range of measures of childhood psychosocial adversity, we also set out to evaluate whether certain components of adversity might be more closely associated with female reproductive timing than others, to further clarify potential explanatory mechanisms. Mothers from the ALSPAC cohort (with mean age of 28 years at recruitment; SD 5 years) were asked to retrospectively recall elements related to their childhood psychosocial adversity in questionnaires administered at approximately 12 gestational weeks (at recruitment), at 32 gestational weeks and when the offspring was about 3 years (approximately 4 years after recruitment). The questions asked mothers to report perceived maternal lack of care (12 questions), maternal overprotection (7 questions), maladaptive family functioning (12 questions), parental mental illness (4 questions), sexual abuse (5 questions) and non-sexual abuse (4 questions). Further information on the specific questions under each of these categories is given in online supplementary table 1. Participants reported their age at menarche retrospectively in whole years at the time of recruitment. Age at natural menopause was also self-reported. We combined information from a questionnaire administered approximately 19 years after recruitment (at a mean age of 47 years) with information from two clinic visits when participants were a mean of 48 and 51 years, respectively. Participants were asked (1) whether they had a period or menstrual bleeding in the past 12 months and (2) when they experienced their last menstrual period. If participants had not had a menstrual period in the past 12 months, they indicated whether this was due to (1) surgery; (2) chemotherapy or radiation therapy; (3) no obvious reason/menopause; (4) other reasons including, for example, pregnancy/breast feeding or use of contraceptives. We used the answer option ‘no obvious reason/menopause’ to indicate natural menopause. Length of reproductive lifespan was calculated as age of menopause minus the age at menarche. The ALSPAC mothers reported their age in years, ethnicity (white/European vs other) and educational qualifications (A level or above/O level or below) at baseline. Information regarding their father’s occupation (manual vs non-manual) and parental highest educational level (A level or above/O level or below), indicating childhood socioeconomic position, was available in approximately 70% of the study sample. We sought to combine all questions available for each form of psychosocial adversity into a single variable. Therefore, we used confirmatory factor analysis to create single latent constructs for maternal lack of care, maternal overprotection, maladaptive family functioning, parental mental illness, sexual abuse and non-sexual abuse (online supplementary figure 1). The confirmatory factor analysis uses information on the correlation structure of a set of observed variables to inform a single a priori hypothesised latent construct. For example, we used information on the answer to 12 questions regarding characteristics of the parents’ relationship, parental separation/divorce and paternal absence to define the underlying latent construct which we called maladaptive family functioning. Higher values for the latent construct identified in the first-order factor analysis reflect higher levels of childhood psychosocial adversity. These six latent constructs from the first-order confirmatory factor analysis were then used to inform a single latent construct reflecting the total childhood psychosocial adversity in a second-order factor analysis. Women with at least 50% of covariates used to inform each of the six latent constructs of childhood psychosocial adversity were eligible for the analysis (n=10 038), to ensure that the definition of the factors was not driven by single measures with the least amount of missing information (figure 1). Illustration of sample. ALSPAC, Avon Longitudinal Study of Parents and Children. The factor loadings for the observed variables onto the six latent constructs in the first-order factor analysis, in addition to the factor loadings of the six latent constructs onto the single latent construct of the second-order factor analysis, are displayed in online supplementary table 1. Measures of childhood psychosocial adversity that are strongly correlated with other measures of childhood psychosocial adversity, and therefore more likely to co-occur, have higher factor loadings. We examined the model fit for the six first-order factor analyses and the single second-order factor analysis using root mean square error of approximations, comparative fit index and Tucker-Lewis fit index, which are displayed in online supplementary table 1. The model fit statistics for this confirmatory factor analysis were reasonable. Structural equation models (SEM) were used to simultaneously conduct the factor analyses of childhood psychosocial adversity as described above and examine their associations with the continuous outcomes of interest. The effect estimates indicate the mean difference in the outcome per SD increase in the latent construct reflecting childhood psychosocial adversity. We constructed an unadjusted model (model 1), a model adjusted for age at recruitment and ethnicity (model 2), and a model further adjusting adult educational qualifications (model 3). We adjusted for adult educational qualifications in a separate model, since it could plausibly be on the causal pathway, particularly for age at menopause and length of reproductive lifespan. A sensitivity analysis adjusted for parental highest educational level and paternal occupation as direct measures of childhood socioeconomic position in the subsample with this information available. The SEM dealt with missing data using a weighted least squares mean and variance adjusted estimator, which assumes missing at random. We subsequently repeated the analysis restricted to individuals with information on all variables used to inform the six latent constructs in the first-order factor analysis. We also conducted a sensitivity analysis including all individuals with information on at least one of the measures of psychosocial adversity used to inform the latent constructs in the first-order factor analysis. Finally, we investigated the associations of paternal absence with the outcomes of interests more closely using linear regression. The analyses were conducted on Mplus V.7.31 (Muthén & Muthén, 2008) and Stata V.14. 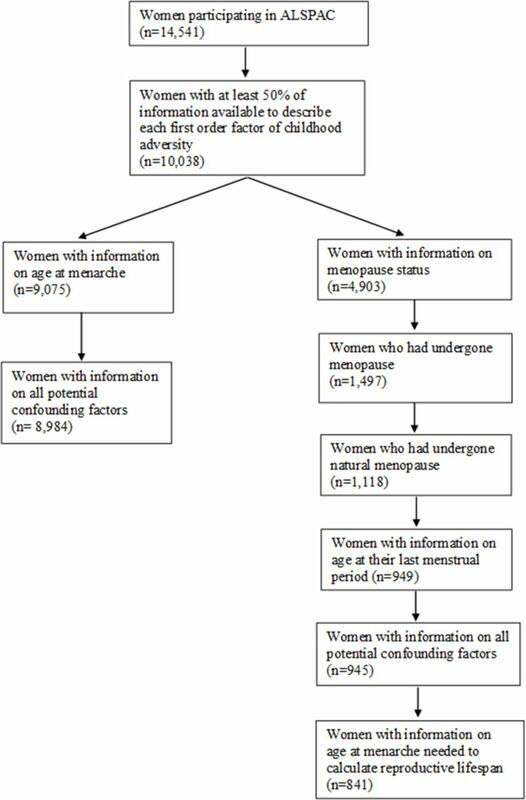 Of the 10 038 eligible women, 8984 with information on childhood psychosocial adversity, covariates and age at menarche were included in the analysis of age at menarche (figure 1). Those with the information necessary to be included in the primary analysis were older, more likely to be European/white and more likely to have higher educational attainment than those without sufficient information (online supplementary table 2). A total of 4903 women had information on menopausal status, out of whom 945 had experienced natural menopause and had information on their age at the last menstrual period (figure 1). Eight hundred and forty-one were included in the analysis of length of reproductive lifespan (figure 1). The women included in the secondary analysis (age at natural menopause and length of reproductive lifespan) were older and on average had a higher educational level compared with those included in the primary analysis (age at menarche) (table 1). There was a modest to strong correlation between the six factors identified in the first-order factor analysis (online supplementary table 3). The mean age at menarche was 12.9 years (SD: 1.5; range 8–19 years). We observed no strong evidence of an association between total childhood psychosocial adversity and age at menarche (table 2). When we examined associations of different types of psychosocial adversity with age at menarche, we observed an inverse association between the latent construct for sexual abuse and age at menarche in both unadjusted and confounder-adjusted models (table 2). There was no strong evidence of associations with any other types of childhood psychosocial adversity (maternal lack of care, maladaptive family functioning, non-sexual abuse, maternal overprotective parenting and parental mental illness) (table 2). The mean age at menopause was 48.6 years (SD 3.8; range 35–58 years), while the mean length of reproductive lifespan was 35.7 years (SD 4.0; range 21–45 years). There was no strong evidence of associations of total childhood psychosocial adversity, nor any of the different types of childhood psychosocial adversity, with age at menopause (table 3) or length of reproductive lifespan (table 4). Multivariable adjustment for direct measures of childhood socioeconomic position did not change the associations (online supplementary tables 4–6). The analysis restricted to individuals with complete information on all variables used to inform the six latent constructs (online supplementary tables 7–9), or to individuals with at least one measure used to inform the six latent constructs (online supplementary tables 10–12), also yielded similar associations. When we restricted the analysis of age at menarche to the study sample for length of reproductive lifespan (n=841), the association with the latent construct for parental mental illness was strengthened, while the association with sexual abuse was attenuated (online supplementary table 13). Finally, paternal absence before the age of 5 was not associated with any of the outcomes after adjusting for potential confounders (online supplementary table 14). However, paternal absence first occurring between 6 and 11 years of age was associated with an earlier age at menopause and more weakly with shorter length of reproductive lifespan (online supplementary table 14). Notably, paternal absence was positively associated with the other five latent constructs from the first-order factor analysis (online supplementary table 15). In this contemporary British cohort, total childhood psychosocial adversity was not associated with female reproductive timing. When we examined various components of childhood psychosocial adversity, childhood sexual abuse was associated with a younger age at menarche, and there was weak evidence of an association with younger age at menopause. Paternal absence, specifically paternal absence first occurring between 6 and 11 years of age, showed an association with earlier menopause and shorter reproductive lifespan. The main strengths of our study is the large size and the range of measures of childhood psychosocial adversity. Since we evaluated multiple measures of childhood psychosocial adversity and three outcomes, we cannot exclude an influence of chance. The retrospectively reported measures of childhood psychosocial adversity were largely based on perceptions that could have been modified in the light of experience over time. We also could not establish with certainty whether the adversity had been experienced before or after menarche, as participants were asked about sexual abuse up to the age of 16/17 years. We relied on recall of age at menarche at a mean age of 28 years. There is mixed evidence of the ability of women to recall their age at menarche.31 32 Furthermore, age at menarche in whole years is a rather crude measure, which might make it difficult to capture more subtle differences. There was also a substantial loss to follow-up at the time points when we gathered information to define age at menopause. We therefore had lower statistical power for the secondary outcomes, and we cannot rule out an influence of selection. In addition, the overall proportion of women who had undergone natural menopause was relatively low in this cohort (22%). Of the 1497 women who had undergone menopause, 379 (25%) had undergone surgical menopause and 1118 (75%) had undergone natural menopause. This likely reflects the young age of the cohort, and the proportion of women with natural menopause will increase as the cohort ages. Notably, we did not observe similar associations of childhood psychosocial adversity with age at menarche in the subsample included in the analysis of length of reproductive lifespan, which could be explained by the age and/or socioeconomic differences among the two samples. The observed link between stress hormones and accelerated depletion of the ovarian follicular could potentially be an explanation for the inverse association between paternal absence and age at menopause.24 Since women are born with a finite number of ovarian follicles, an accelerated depletion can result in an earlier menopause.37 While we acknowledge that sexual abuse is likely to be the most severe childhood experience we were able to capture, it is possible that paternal absence could be a stronger indicator of cumulative psychosocial adversity across the life course, which might in turn be more likely to influence age at menopause as opposed to age at menarche. For example, paternal absence is plausibly associated with a broad range of measures of social disadvantage and lifestyle characteristics that are difficult to capture, which could in turn be linked to higher levels of stress hormones across the life course and subsequent accelerated ovarian follicular depletion.38 39 Further information is necessary to substantiate this hypothesis. Childhood sexual abuse was associated with a lower age at menarche, and showed some evidence of an association with a lower age at menopause, but this needs to be examined in larger samples. Paternal absence was also associated with earlier age at menopause in secondary analyses. Other aspects of childhood psychosocial adversity showed no strong evidence of associations with female reproductive timing. The majority of previous studies looking at childhood psychosocial adversity and age at menarche could not quantify total psychosocial adversity. Limited knowledge is currently available regarding whether any aspects of childhood psychosocial adversity might be associated with age at menopause or length of reproductive lifespan. It therefore remains unclear if any of the previously reported associations between childhood psychosocial adversity and earlier menarche might also be reflected in an earlier menopausal transition. In our comprehensive confirmatory factor analysis of childhood psychosocial adversity, we observed no association between total childhood psychosocial adversity and age at menarche, age at menopause or length of reproductive lifespan. Our findings inciated a robust association specific to childhood sexual abuse with earlier menarche. This is the first study to report that childhood sexual abuse might also be associated with earlier menopause, but this needs to be confirmed in larger studies. CommitteeAE. Accessing data from the ALSPAC cohort. Contributors MCM and AF designed the study. MCM conducted the analysis and drafted the initial paper. ELA and LH contributed to the quality assurance of statistical methods. CJJ and ISP-V contributed to the interpretation of the results. All authors critically revised the paper. Funding The UK Medical Research Council, the Wellcome Trust (102215/2/13/2) and the University of Bristol provide core support for the data collection in ALSPAC. MCM, ELA, LH and AF work at the MRC Integrative Epidemiology Unit at the University of Bristol, which receives infrastructure funding from the UK Medical Research Council (MRC) (MC/UU/12013/5). AF and MCM are funded by a UK MRC fellowship awarded to AF (MR/M009351/1). LH is funded by a UK MRC fellowship (MR/M020894/1). This work was also supported by a grant from the UK Economic and Social Research Council (ES/M010317/1) and the National Institute on Aging of the National Institutes of Health (R01AG048835). Ethics approval Ethical approval for the data collection in ALSPAC was granted by the ALSPAC Law and Ethics Committee and the Local Research Ethics Committees. Data sharing statement ALSPAC data are available by contacting the executive committee at alspac-exec@bristol.ac.uk.